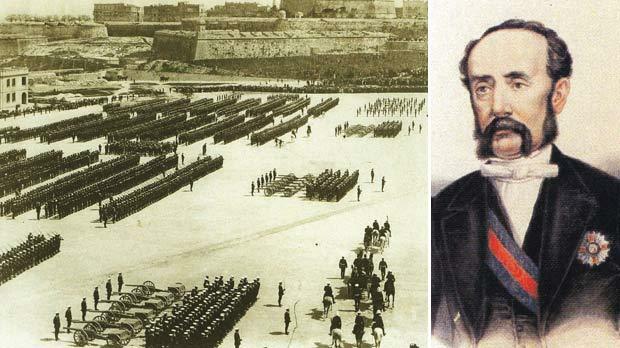 British troops in Malta increased the demand for prostitution. Right: Governor Sir Gaspard Le Marchant. The 1898 ordinance which prohibited the running of brothels. Since British rule, prostitution itself has not been illegal, but certain activities connected with it were and are still prohibited. In the 19th century, as a consequence of the overwhelming popularity of prostitution, venereal disease was becoming rife and in an effort to prevent the disease spreading, a law was promulgated in 1861 by Governor Sir John Gaspard Le Marchant. The law laid down that notorious prostitutes were obliged to undergo a medical test three times a month. The test to ascertain whether or not a person was affected by venereal disease was done by the police doctor in a place assigned for the purpose by the commissioner of police. According to Ordinance IV of 1861, prostitutes were summoned to appear before the medical examiner, and whoever refused to be examined was guilty of an offence and liable to conviction and imprisonment for a term not exceeding three months. However, the punishment was remitted as soon as the person sentenced consented to the examination. Diseased prostitutes were kept in custody, and on the same day of their examination were brought before the Court of Judicial Police. After confirmation upon oath by the doctor, infected prostitutes were taken to hospital or to any other place appointed by the head of government and kept there until they were cured. However, upon request, the court had the duty to appoint two or more other doctors for the purpose of ascertaining the existence of the disease. A similar law, The Contagious Disease Act, was passed in Great Britain in 1864. The law allowed police officers in garrison towns and naval ports, such as Portsmouth and Plymouth, to arrest suspected prostitutes in order to have them undergo medical examinations at certified hospitals. If they were found to be diseased, they could be detained in special hospitals for a maximum period of three months. Another attempt to control prostitution was the 1898 law which amended the Code of Police Laws with regard to lodging houses. By virtue of these amendments, any house in which more than one public prostitute lived was considered as a lodging house, and licences would not be issued by the police. Moreover, it became unlawful for a prostitute to live with another prostitute in the same house unless permission was obtained from the commissioner of police. Sergeants stationed in areas occupied by prostitutes were directed to periodically inspect the abodes of prostitutes to ascertain whether or not there had been any breaches of the law. During these inspections the sergeant had to be accompanied by another police officer. This law brought to an end the legal brothels that existed at that time, and those convicted of keeping or managing a brothel became, on conviction, liable to punishment with a term of imprisonment for a term not exceeding three months. The 1899 law also made it unlawful for a prostitute to live in ground-floor rooms or to live with another prostitute in one room of any apartment. District medical officers, acting on special instructions from the Chief Government Medical Officer, were empowered to enter houses where more than one prostitute resided to ascertain that this law was complied with. However, previous notice of not less six hours had to be given before the inspection. 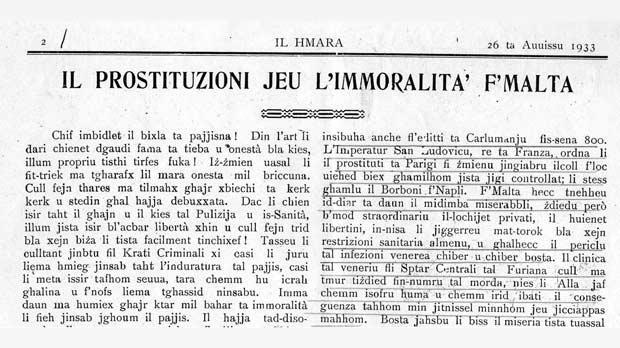 An excerpt of an article appearing in Il Hmara on August 26, 1933, decrying the rise in prostitution in Malta. 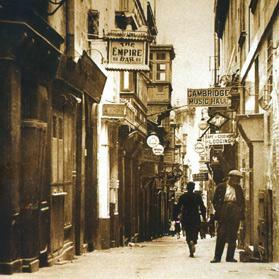 Strait Street, Valletta, where prostitutes were prohibited from residing by means of a government notice dated December 18, 1899. By virtue of a government notice dated September 1, 1899, it became unlawful for any prostitute to reside in any building situated at a distance less than 50 yards (45 metres) from any place of public worship. The notice also prohibited prostitutes from residing in nearly 45 per cent of the streets of Valletta. The lower part of Strait Street was one of the forbidden areas, and by virtue of a Government Notice dated December 18, 1899, prostitutes were driven out of the whole street. Prostitutes were also forbidden from residing in any building adjoining any licensed wine and spirit shop. It was also unlawful for a prostitute to stay at the street door of her residence or of that of other prostitutes. The same notice made it illegal for a prostitute to loiter or stay in any street, or within 200 yards (180 metres) distance of a street in which prostitutes resided. Their street doors had to be kept closed, except for the purpose of entering or leaving. The windows and other openings on the ground floor were to be kept closed unless provided with wooden blinds constructed and affixed in a manner approved by the police. In the following years, prostitutes were not allowed to live in certain streets of various localities, namely Prince of Wales Road and Strada Marina, in Sliema, Sliema Road and Manoel Street in Gzira and Strada Conservatorio, Strada Botanico and Strada Leone in Floriana. There were other streets in Ħamrun, Marsa, Msida, Pietà, St Julian’s, Paola, Tarxien, Balzan, Birkirkara, Cospicua, Senglea, Vittoriosa and Kalkara where prostitutes were not allowed to live. When the Criminal Law was amended by virtue of Ordinance XIII of 1899, any man was considered to lead an idle and vagrant life also if he knowingly lived, wholly or in part, on the earnings of prostitution. It became illegal for such pimps to engage any person for the purpose of prostitution or for any other immoral purposes. The Criminal Code also dealt with the prostitution of underage descendants by their ascendants. It was unlawful for any ascendant by blood relation or affinity who, by the use of violence or threats, compelled or induced by deceit, any underage descendant into prostitution. Such crimes were punishable by imprisonment for a term ranging from three to six years. The same punishment applied to a husband who, by violence or threats, compelled his underage wife or a minor under his tutorship into prostitution. In cases of women of age induced into prostitution by the use of violence by their husbands, criminal proceedings were instituted on the complaint of the women, and husbands risked a period of imprisonment ranging from one to four years. It is interesting to note that when the 1918 amendments of the criminal code were drafted, corporal punishment was being reintroduced as part of the punishment. It was suggested that flogging by the cat-o-nine tails or the birch rod should be part of the sentence. However, there was opposition to this draft clause and thus it was not included in Act XIV of 1918. Another law regarding prostitution was the White Slave Traffic (Suppression) Ordinance of 1930. 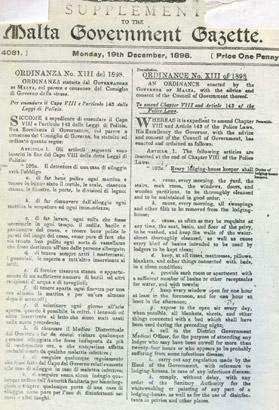 By virtue of this Ordinance, whoever, in order to gratify the lust of any other person, compelled by means of violence or threats, or induced by deceit, a woman of age or under age to leave Malta for the purposes of prostitution elsewhere, became liable, on conviction, to imprisonment for a term not exceeding two years. The expression ‘of age’ meant a woman who had attained the age of 21. 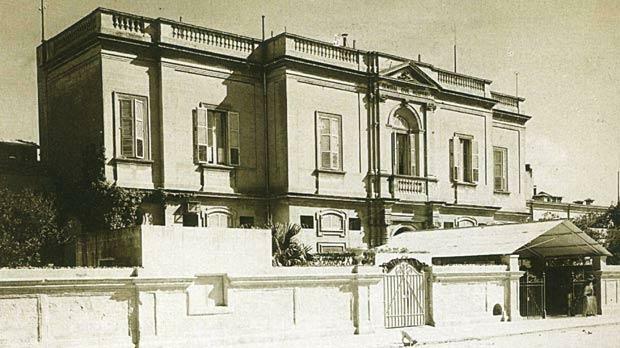 The Central Hospital at Floriana where infected prostitutes were treated. According to the police annual report published in April 1905, there were 152 women registered as prostitutes; however, the commissioner of police remarked that there was a considerable number of unregistered prostitutes. In the following years, soldiers’ wives living in Malta joined local prostitutes, and the British military authorities carried out investigations to curb these clandestine prostitutes. For this purpose, the police issued special police permits to army personnel to carry out investigations, and the police had to assist in these investigations. Since 1930, when there was reasonable cause to suspect that a woman or a girl was detained against her will for immoral purposes, the commissioner of police was authorised to issue a warrant to any police officer not below the rank of sub-inspector, authorising him to search for her. Contraventions against the regulations regarding prostitutes were rife in 1923, and according to the police annual report, there were 3,307 convictions; however, the number dropped to 293 by 1930. The 1920-21 police report mentioned the increase in the number of cases of venereal disease reported among soldiers, sailors and other people, which necessitated more stringent police measures to keep common prostitutes under control. With the co-operation of the Public Health Department, 203 women were subjected to a medical examination during that year and the majority of these were examined weekly. The killing of prostitutes was not a rare event in the 19th century, and the first prostitute killed in Malta since 1800 lived in a mezzanine in St Philip Street, Senglea, where she entertained her clients. Grazzja Grech, known as Iż-Żol-in-Żol, was found almost naked on her blood-soaked bed on April 13, 1832. Giovanni Fedele, aged 18, from Sliema, and Pawlu Laus, 21, from Valletta, were eventually accused with her murder and were hanged at Floriana. The corpse of Maria Baldacchino, a prostitute known as Il-Furfiċetta, who lived in St Frederick Street, Valletta, was found in a well at her residence on July 23, 1851. A 28-year-old Turk, Pawlu Azzopardi, a former Muslim previously known as Hamet bin Mabruk, was found in Baldacchino’s residence. After a search on Azzopardi, some gold jewellery was found in his pocket and this supplied a good motive for the murder. Azzopardi was charged with murder and his trial began on August 27, 1851. He was found guilty and sentenced to death. On August 10, 1880, at about 9pm, a man dressed as a peasant and carrying a wicker basket on his head was seen entering the residence of Rosina Cristofalli, a Sicilian prostitute who lived at Lion Street, Floriana. Cristofali was later found stabbed to death, and police enquiries revealed that earlier that week, the woman reported to the police that she was being threatened by Giuseppe D’Urso, another Sicilian who lived in Malta. D’Urso was apprehended as he tried to embark on a ship which was sailing for Tunis. D’Urso was tried for murder and received the death penalty for his crime. Concetta Guadagno was another Sicilian prostitute who lived in Malta. She was found dead in her residence at Valletta on August 23, 1897. Her husband, who lived on her earnings, was suspected of having committed the crime; however, he managed to leave the island. Prostitute killings became rare events in the 20th century, with the first murder occurring in August 1970. The stabbed body of Maria Grech, aged 29, was found in her home in Fountain Street, Valletta. An American sailor, Hustone Eugene Featherstone, was charged with the crime; however, he was found of unsound mind and was sent to the mental hospital. Irene Johnson, aged 45, met the same fate on February 6, 1972. She was found dead in her home in the same street, and the crime remained unsolved. The reasons that led Ġużeppi Vella to stab George Godwin were unique in the annals of homicide in Malta. During the night of January 12, 1893, seamen Godwin and James Richardson of the HMS Colossus decided to pay a visit to one of the prostitutes in Valletta. Richardson was the first to enter the prostitute’s house. Godwin waited outside but, when it was his turn, Vella, a Maltese soldier, insisted that he should go in first. Godwin remarked that he had been there before and a heated argument ensued with the two men hurling insults at each other. The altercation grew in intensity until Vella whipped out a knife from his pocket and stabbed Godwin in the chest, piercing his heart. Vella was hanged at Corradino Prison for this murder.